With 1000 Words services, you are getting so much more than just a photo booth. You’re creating lasting memories, providing a fun activity for guests, breaking the ice at an event, and giving printable party favors. 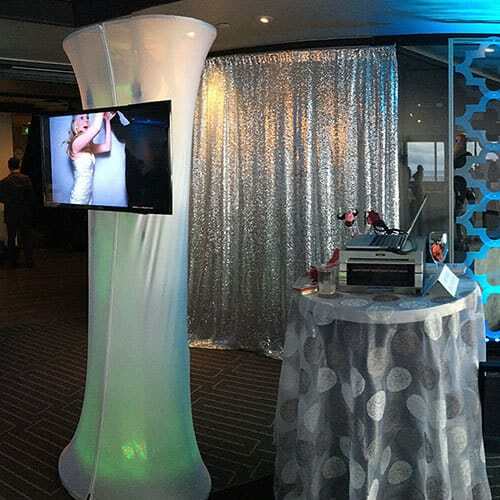 We customize our photo booths to suit every occasion, from fancy soirees to corporate events to backyard BBQs. Rather than an enclosed black box, our custom designed photo booth is a cool, sheer hourglass kiosk lit with a color to match your event. Every 1000 Words Photo Booth comes with a dynamic slideshow shown on HDTVs or large projection screens throughout the event. Everyone will have time to see themselves on the big screen! "Now THAT is Speedy Service!"